The American Obesity Associated has recently come out with a report that gives details of startling rise in the number of obese people in America. According to their findings, nearly one-third adult American population is obese. Most people who are obese resort to fad diet plan to reduce their weight because these diet plans usually promise instant results. However, most of these magical shortcuts don’t offer long-term solution of the problem. Also, some fad diets can have a negative impact on your health. Changes in technology has made most people so used to instant society that they start trusting companies and experts who guarantee instant results. Today, most people opt for fad diet because they promise quick and instant weight loss. The biggest beneficiaries of these schemes are companies that launch these diet plans. Most companies that have introduced these diet plans have made millions of dollars from these instant weight loss plans. Most fad diet plans work by convincing people that their weight management plans are effective. This industry is growing at a rapid pace as there an alarming rise in the number of obese people in the world. Today, most people want to look slim and fit and will do anything to lose weight. More and more people are opting for these fad diet plans because they work for a short period of time. Most people lose weight initially when they reduce their calorie and carbohydrate intake. However, most weight that lost is not from body fat but from lean muscle and water. Even though the strict diet regime is easy to follow for a short duration, in the long run most people get bored eating the same kind of food. When they change their diet plan, they start regaining their weight and at times may gain even more weight. Another reason why you must avoid fad diet plans is because it can affect your life span. Recent studies have proved that these diet plans can have a negative impact on the life span of a person. 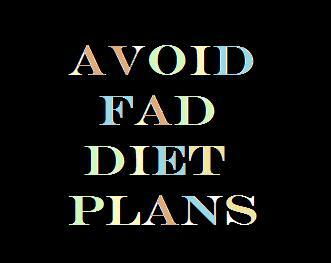 At times, people who opt for fad diet plans become addicted to these plans. There are many men and women who are forced to continue with the diet plan because they have become addicted to it. This can have a negative impact on the body as it may not be able to eat all kinds of food. Even though FDA comes out with regulations on diet plans, most experts are of the view that these regulations are insufficient to protect the interest of the consumer. There are many diet plans that claim to offer instant results without disclosing the risk of their diet plan. Most programs blame consumers for ineffectiveness of the program. Therefore it is important that you consult a doctor or nutritionist before you opt for a diet plan. Also, it is best that you don’t make any drastic changes in your diet as it can have long-term consequences. I love how these new diets come to market and everyone jumps on board only to find out it’s just another fad that doesn’t work and can be harmful to your health. People just need to sit down, get their facts straight on what to eat, what not to eat and they will lose the weight they want to. It’s a whole lifestyle change, and for the good.